deglutition disorders, aspiration pneumonia, fluoroscopy. Introduction: The literature reports that when it comes of instrumental assessment of swallowing in children, undoubtedly, video fluoroscopy of swallow offers great advantages over the endoscopic study. Objective: Check the risk of aspiration pneumonia after the study of swallowing by video fluoroscopy, in children with dysphagia. Method: In a study of prospective cutting, participated 16 children aged between 6 months and 10 years, with an average of 5,2 years, referred for study of swallowing by video fluoroscopy. Were tested 4 consistencies, pudding, nectar, honey and liquid. The presences of signs and/or respiratory symptoms were evaluated pre and post study of deglutition by video fluoroscopy, through history and clinical exam. When necessary was asked chest x-ray. Results: Of 16 children, 5 didn't presented dysphagia. In 11 children the exam showed 4 with mild dysphagia, 2 moderate and 5 severe, as classification of OTT (1996) - Classification of severity of dysphagia to the video fluoroscopy. Of the 7 children who aspirated during the exam, only 1 presented respiratory symptoms after the deglutition study, but without signal of pneumonia to the physical examination. Conclusion: In the studied population there were no occurrences of aspiration pneumonia after the study of deglutition was performed by video fluoroscopy, despite the occurrence of aspiration during the exam in about 50% of cases. In oropharingeal dysphagia, the complications of lung diseases caused by aspiration are the most difficult clinical management. Therefore, the detect ability and the characterization of this aspiration, which occurs in the pharyngeal phase, are primary for prognosis and rehabilitation. The aspiration can be inferred through clinical evaluation, but its objective confirmation should be done by video fluoroscopy (1). The videofluoroscopy of deglutition is considered the best instrumental method to evaluate deglutition in children, as it evaluates from the beginning of the oral preparatory stage to conclusion of esophageal stage (2). However, studies indicate that children with severe dysphagia possess high risk in having complications during the examination (3). The instrumental exam such as video fluoroscopy is a great ally to evaluate babies and children with deglutition disorders. Through this exam we have been observed high incidence of silent aspiration in radiographics studies involving children with multiple disabilities (1). Dysphagia patients have the risk of aspiration raised, i.e., the passage of food and/or fluids enter below the vocal cords through the airways, raising the risk of pneumonia and problems associated (4). Yet according to these authors, most studies about silent aspiration in dysphagic patient, supports the use of video fluoroscopy of deglutition for its detection, considering the most sensitive exam in detection of aspiration during deglutition (2). To Langmore (1999) there are three prerequisites to evolve pneumonia aspiration: a) pathogenic germ present in the aspirated material; b) the material must be aspirated and c) the lungs should be unable to resist to the pathogenic germs (5,6). In child, without any doubt, the video fluoroscopy of deglutition offers great advantages over the endoscopic study, as well as being technically feasible, it practically reproduces the real situation of deglutition (7). Despite of advantages, as the analysis accurate and immediate of deglutition and the non- invasive procedure, there is for the pediatric population a greater risk than the adults, as the radiosentivity of the thyroid is known to be particularly elevated (8). During the exam, the examiner must observe if there is or not perception signs of laryngotracheal aspiration, such as cough, choke, clean the throat and weep. If the patient does not show any of those signs, he will be considered as a silent aspirator with risk to evolve pneumonia by aspiration (9). Some of the authors refer to close the examination if it will be any significant aspiration of the bolus without any cleaning reflex or voluntary cleanup of the airways, for although barium is considered inert, the entry of large amount into the respiratory tree is not recommended, once it could cause problems to the persons with systemic diseases or respiratory. This study aims to verify in children with high risk by accompanying speech therapist and physician the occurrence of aspiration pneumonia right after the video fluoroscopy exam. This was a prospective cohort study in 16 children aged between 06 months and 10 years-old, with an average of 5,2 years-old, being 50% male and 50% female, with average weight 14kg with complaints of dysphagia, they had been referred by the pediatric department for deglutition study through video fluoroscopy to research dysphagia. In the description of underlying disease, 13 children presented Cerebral Paralysis, 01 child with Microcephaly and 02 children with Encephalopathy. All of the children who presented the dysphagia symptoms were referred to study of deglutition by video fluoroscopy. The criteria to include the children in this research were: clinical condition to take examination is awake, active and with medical permission. It was excluded all of children who presented pneumonia before taking examination. The study was approved by the Ethics in Research Committee, under nº. 000025/2009, (Annex I). To collect data about the underlying disease, dysphagia, signs and pneumonia symptoms cause, it was used patients´ records and initial interview with children´s responsible who signed a term authorizing the use of the data in the research. It was used the Functional Oral Intake Scale - FOIS, which follows an scale from Level 1 to Level 7, of which, less the value is less is the via oral food ingestion (10), in order to classify the children oral intake. Before video fluoroscopy examination children were underwent chest radiography in order to exclude any possibility of prior pneumonia. The x-ray equipment used was Siemens - model Axiom R100, monitor Siemens and model M44-2, which was also used to the video fluoroscopy of deglutition examination. In order to perform examination children were placed sit alone in 90º or, when necessary, on the mother´s or responsible lap, vision with lateral radiograph. The consistencies presented were: Pudding, Honey, Nectar and Liquid, composed of water, Barium Sulfate (100% Bariogel brand), as radiological contrast which contains 1g barium sulfate and vehicle g.s.p. 1ml, for pediatric and adult use, and as thickener we used the instant modified cornstarch from the brand THICK UP®, which is composed by modified cornstarch (E1442), malt dextrin, Tara gum, xanthan gum and guar gum. To obtain the consistencies, we used the nomenclature of National Dysphagia Diet: Standardization for Optimal Care (11) and the thickner THICK UP®, which it was used for the nectar (from 51 to 350cP), -200 ml of water, 2 sachets (10 gr) of THICK UP®, Honey (from 351 to 1750cP) - 200ml of water, 2½ sachets (12,5 gr) of THICK UP® and for Pudding (> than 1750cP), - 200ml of water, 3 sachets (15 gr) of THICK UP®. instant food thickener from brand Thick&Easy® (HORMEL HEATH LABS. SWISS) composed of starch, nutritional composition presented as 100g: 375kcal, 100g of carbohydrates and e 125mg of sodium. The utensils used to offer those consistencies were spoon, glass and bottle in case of the babies. In order to record the examination were used computer from brand HP Pavilion tx2075BR Notebook PC and for image collector we used Sapphire - Wonder TV-USB. To classify the dysphagia, we used the Severity of Dysphagia to Fluoroscopy - OTT (1996), which classifies as Normal Deglutition, Light Dysphagia, Moderate Dysphagia and Severe Dysphagia (12). After examination patients returned within a week for medical evaluation in order to check if there are signs or respiratory symptoms and for clinical speech evaluation for the signs or symptoms of dysphagia, history of aspiration and clinical conditions by means of a protocol. This period of 07 days to return was set according to the availability of the targeted group, using the limited days for that evaluation. It was conducted new chest radiography, when the signs and respiratory symptoms suggested pneumonia. From the referrals of deglutition study by video fluoroscopy of deglutition, 06 children were referred by Gastroenterologist, 03 by pediatrician, 04 by Speech Therapist, 02 by Pulmonologist and 01 by Immunologist . Within the 16 children only 02used metal type tracheotomy and only 01 had been hospitalized. Before the examination, 04 children presented respiratory symptoms, cough with phlegm, respiratory difficulty, fever and dry cough, although without pneumonia diagnosis. From those patients with respiratory symptoms before examination, for 02 children the symptoms persisted after taking the exam and the other 02 children the symptoms disappeared. Related to the via oral by Functional Oral Intake Scale - FOIS (9), 5 (31,25%) were on N1 (Level 1), 1 (6,25%) on N2, 1 (6,25%) on N3, 6 (37,50%) on N5 e 2 (12,50%) on N7. But the occurrence of aspiration during the videofluoroscopy it was 7 (43,75%) children, as shown on Table 1. By the classification OTT (11) of the Severity of Dysphagia to Fluoroscopy, 5 (31,25%) children presented normal deglutition, 4 (25%) light dysphagia, 2 (12.50%) moderate dysphagia and 5 (31,25%) severe dysphagia (Table 1). From 7 (43,75%) children whose examination showed aspiration, 2 (28,5%) simultaneously aspirated consistencies of pudding, honey, nectar and liquid, other 3 (42,8%) children aspirated honey, nectar and liquid and finally, 2 (28,5%) aspirated only the consistency of liquid, as shown on Table 2. Among 7 (43,75%) children, whose presented tracheal aspiration during examination, only 2 (28,5%) presented respiratory symptoms after deglutition study, however without pneumonia signs on physical examination (Table 3). In this oropharingeal dysphagia, the complications of lung diseases caused by aspiration are the most difficult clinical management. Therefore, the detect ability and the characterization of this aspiration, which occurs in the pharyngeal phase, are primary for prognosis and rehabilitation. The aspiraton can be inferred through clinical evaluation, but its objective confirmation should be done by video fluoroscopy (1). The video fluoroscopy of deglutition is considered the best instrumental method for evaluation of deglutition in children, therefore it evaluates since the beginning of the oral phase to the esophageal conclusion phase (2). Table 1 shows that amongst those 16 children evaluated, 7 (43,75%) presented tracheal aspiration, which according to the literature it would be a potentiating to aspiration pneumonia occurrence, as AHCPR, U.S. Government Agency, dysphagia patients who aspire has 50% chance higher to evolve aspiration pneumonia, compared to the patients who don´t aspire (5). Among the survey population, 5 (31,25%) children were classified with severe dysphagia and some studies indicate that children with dysphagia have high risk to develop complications during the examination (3). Observing Table 02 in this research, we realized that in the examination liquid consistency was the most aspired, and the minor occurrence was the pudding consistency, indicating that the liquid consistency has a higher incidence of aspiration which, according to the literature, it would be another complicating, as the risk on patients who present aspiration pneumonia rises when the liquid consistency is aspirated. 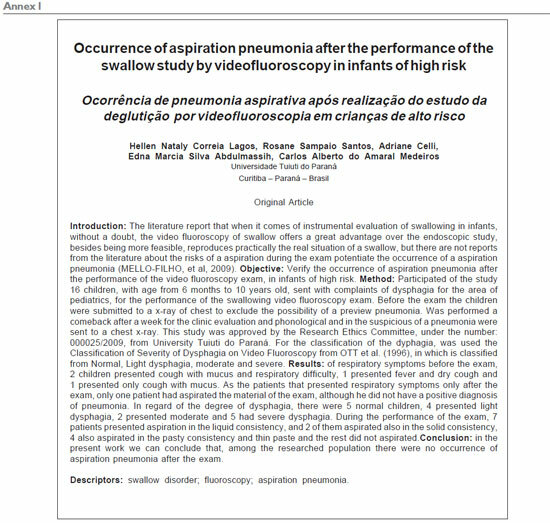 In a study, in which there was a retrospective examination of deglutition video fluoroscopy conducted in 150 children with deglutition dysfunction, there were more cases of children with pneumonia who had aspired liquid consistency, which indicated different results from those who had aspired thick liquids and purée consistency, in which pneumonia cases were much lower (13). In 7 (43,75%) children who aspired during the deglutition examination, after a week only 2 (12.50%) children presented some respiratory symptom, therefore a child presented the same symptom before the evaluation, and the other child despite having aspirated all of the consistencies and being classified with severe dysphagia, didn´t have positive for pneumonia in physical examination, contradicting what literatures had quoted before. These results also shows the opposite from what the other authors states (14), which say that one of the complications in doing studies of deglutition through video fluoroscopy is that the patient with that disorder can be exposed to the risk of aspirating the contrast, and in this present research is possible to observe a few number of pulmonary complication after examination (Table 3), and without diagnosis for pneumonia. a) The video fluoroscopy of deglutition examination increased the risk of pneumonia? b) The risk benefit justifies the procedure? It is worthy to clarify here that, during the video fluoroscopy evaluation, we could only observe a fractional part of deglutition, and therefore we could not interfere effectively in the occurrence or not of aspiration during deglutition, we could only infer if patient had aspired or not at that fraction of time. Thus, it keep on being the best method to evaluate deglutition on children, as this present research showed evidences and safety on the procedure, even in children with severe dysphagia, and further more, also it is important to underline that video fluoroscopy may have on clinical evaluation not only a complementary nature , but also it helps to determine the therapeutic approaches in a more objective way (1). Video fluoroscopy of deglutition has been the most instrumental method used simultaneously to the deglutition clinical evaluation. But, it is worth to say that is very important having a specialized multidisciplinary examination team. 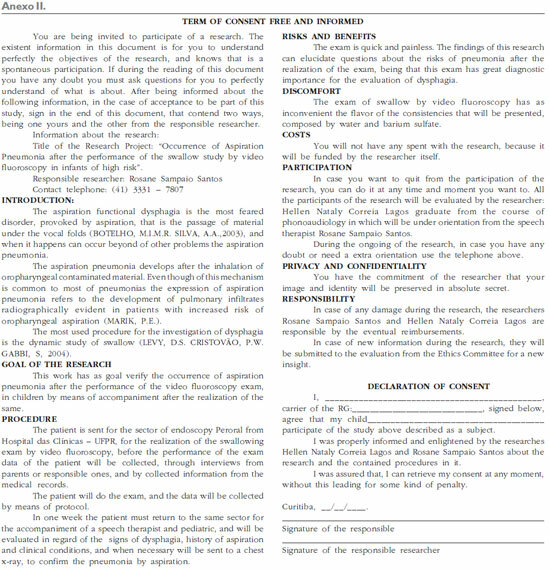 At the present study there are evidences of safety on this procedure, but in order to affirm this question with more accuracy, it´s necessary a greater amount of population researched, leaving it amongst another as a suggestion for continuing researches in this field, as well as correlate the examination data with the underlying disease. In the studied population, there was not occurrence of aspiration pneumonia after study of video fluoroscopy of deglutition, despite of occurrence of aspiration during examination in about 50% of cases (7/16). Authors thank to Dr. Elmar Allen Fugmann for giving the sector study, to the speech therapists and radiologist from the same sector. 13. WEIR K. et al. Oropharyngeal Aspiration and Pneumonia in Children. Pediatric Pulmonology. 2007, 42:1024-1031. Financial support or equipment supplier: Hospital de Clínicas da Universidade Federal do Paraná. Article received in 2011 March 15th. Article approved in 2011 June 25th.